Zika virus is a Flavivirus related to dengue, yellow fever, and West Nile. Each virion is roughly spherical in shape, measuring about 40 nanometers in diameter (Figure 1). The viral capsid proteins surround and protect the 10 kb strand of RNA that makes up the Zika genome. An envelope composed of viral glycoproteins and a host-derived membrane surrounds the capsid. The glycoproteins allow the virus to target and invade cells during an infection. The Zika infection is often asymptomatic in healthy adults – it is believed 75% of cases are not diagnosed. 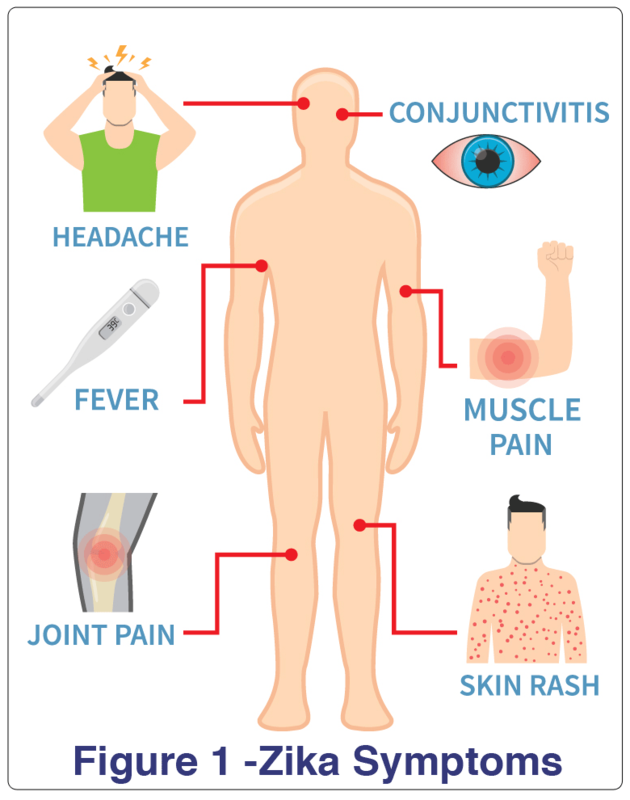 Symptoms of Zika last 3-7 days and include fever, joint pain, conjunctivitis (or “pink eye”), and a rash (Figure 1). In a few patients, Zika infections have been linked to Guillain-Barre Syndrome, an autoimmune condition that results in nerve dysfunction and muscle weakness. The most devastating effect of Zika infection is in pregnant women, in which the virus causes defects in the developing fetus such as brain damage and microcephaly (small heads and reduced amount of brain tissue). At this time, there are no specific treatments for Zika. Most infections are treated with rest, fluids, and a fever-reducing drug like acetaminophen or ibuprofen. Pregnant women are carefully monitored to determine whether the virus is affecting fetal development. Why is Zika Virus in the news? Zika is not a new virus. Scientists first identified Zika in Uganda in 1947, and sporadic Zika infections have occurred in Africa and parts of Asia since the 1950’s. However, the 2015-16 pandemic that began in Brazil and quickly spread through the Americas has brought widespread attention to this virus due to its shocking consequences. Since Zika Virus is a mosquito-borne contagious disease, has the public health community concerned. This makes these small insects are both a nuisance and a public health concern. For more information on the current Zika pandemic, be sure to visit the Center for Disease Control (CDC) website at https://www.cdc.gov/zika. A vaccine for Zika virus is in development as of August 2016. Until it is available, the best way to prevent infection is to prevent mosquito bites. As mosquitos transmit the virus, controlling the mosquito population can limit the spread of the disease. Individuals can protect themselves from mosquito bites by wearing proper clothing and insect repellent. Since Zika is transmitted through blood and body fluids, transmission of the disease can also occurs through blood transfusions or intimate contact with a partner. First, the medical professional will compile the patient’s medical history, including clinical symptoms and dates of travel to areas with a history of the epidemic. Since the symptoms of Zika can mimic Influenza or encephalitis, the Enzyme Linked Immunosorbent Assay (or ELISA) is used to rule out these diseases and to plan the best treatment plan. The ELISA uses antibodies to detect the presence of specific biomolecules (i.e. peptides, proteins, antigens and hormones) in a complex sample. This assay is commonly used for medical diagnostics, as it is can be used to identify antigens in blood and other biological samples. Which kit would I use to teach this lesson? We have successfully used EDVO-Kit #267, Single Antibody ELISA Diagnostics, to teach this lesson in many of our Professional Development courses. For more inspiration, check out our FREE RESOURCES!